Driver management softawre to Optimize your system by finding driver updates. ...... and 2008 R2 Server, 2003 Server, 2000 in 32 bit or 64 bit Editions. Machine Intelligence - Automatically Update Drivers software Machine Intelligence identifies your specific computer to provide you the most accurate drivers available. 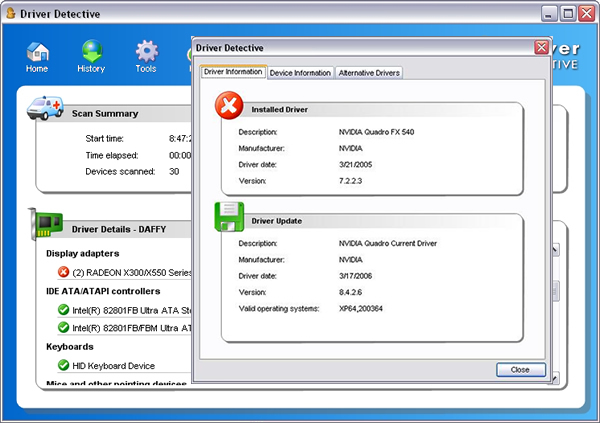 Manufacturers supported by Automatically Update Drivers software include: Dell, HP, Compaq, Gateway, and many more. Industry Leading Scan Technology - Automatically Update Drivers software is using the most accurate and comprehensive Driver Scanning Engine (DSE) on the planet, built from the ground up using the latest technology with over 10 years of experience in the driver scanning/detection industry. Integrated Customer Support Drivers Head - Quarters has a well-trained and experienced support staff available to help you through integrated customer support tools. Qweas is providing links to Automatically Update Drivers 2010 as a courtesy, and makes no representations regarding Automatically Update Drivers or any other applications or any information related thereto. Any questions, complaints or claims regarding this application Automatically Update Drivers 2010 must be directed to the appropriate software vendor. You may click the publisher link of Automatically Update Drivers on the top of this page to get more details about the vendor.